In honor to celebrate our new Poli-Shirt, what better to do so by having this week dedicated to one of the Pokémon that inspired everything! Poliwhirl has always been a popular picking when Pokémon came over to the America's in 1998. Now his swirl is back on our exclusive shirt, and back on the site to kick off our Monday. 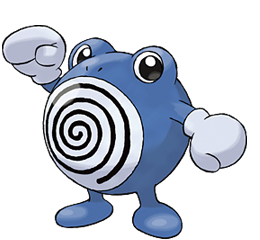 It evolves from Poliwag at level 25, and then into either Poliwrath when exposed to a Water Stone or Politoed when traded holding a King's Rock. Poliwag undergoes a dramatic change when it evolves to Poliwhirl. The most notable difference is that it has become bigger and gained arms with gloved hands while losing its tail. The eyes have moved to the top of its head and it apparently loses its visible mouth. Its nostrils are now visible. Curiously, the swirl on its abdomen as Poliwag reverses when it evolves. The skin on most of Poliwhirl’s body is moist, due to an oily fluid. However, the skin on its belly spiral feels smooth. • The logo for the Pokémon Center in Tokyo featured Poliwhirl until it was replaced by Piplup in July 2007. • Poliwhirl is based on a tadpole. The spiral pattern on its belly is supposed to represent how the organs of tadpoles can sometimes be seen through their transparent skin. Its evolution is based on a tadpole's metamorphosis.